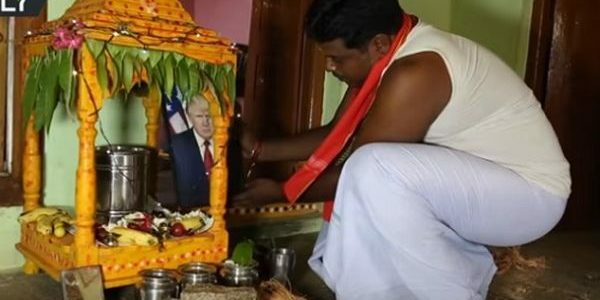 An Indian man who had been worshipping US President, Donald Trump, the 45th President of America, for over the past three years, has shared his story. An Indian man has found a ‘god’ among us – not Zeus but President Donald Trump. 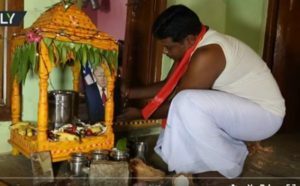 31-year-old Bussa Krishna, a farmer from the Indian state of Telangana, has placed a photo of the president in his prayer room and worships it daily along with other Hindu gods, according to the Hindustan Times. The idea to worship Trump came after Srinivas Kuchibhotla, a software engineer from India, was killed by a U.S. Navy veteran last February. “I believe Indians can win over anyone with their spiritual powers. When you cannot take on a mighty person directly, you can win over him with love and worship and that is what I am doing,” he added. Worshipping politicians is kind of a thing in India, the paper said. A number of temples have been built in honor of the late M.G Ramachandran, who was also a movie star.